In 1984, an Oklahoma native, Thomas R. Young, started a painting business and began to paint in Tulsa, OK. As the company grew, he decided it was time for a change. In 1989, he relocated the company to Fairfax, VA. In 2000, the company continued to broaden its horizons by offering a wide range of renovating services. While much has changed while serving our community for more than 20 years, many things have remained constant including a defined set of values which foster a true sense of family and a commitment to the finest craftsmanship. We offer prompt, dependable, courteous services, coupled with the highest quality craftsmanship. Our staff is highly motivated, hardworking, skilled with a broad range of experience and expertise, and always demonstrating a high degree of professionalism. We are fully licensed and insured. Our team is committed to delivering on our obligations, always. Our pursuit of measurable excellence is defined by a vision of quality that exceeds our clients' expectations. The personal growth, goals, and the compassion inherent in our team has positively impacted the community and will continue to do so as our company expands into the future. T. R. Young Services has been a member of the PDCA Washington Metro Chapter since 1998. 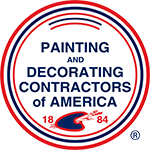 Founded in 1884, the Painting and Decorating Contractors of America (PDCA) is a national trade association dedicated to the success of painting and decorating contractors through ethics, education and excellence. PDCA is recognized and supported by many industry manufacturers and suppliers as the premier organization committed to helping professional painting and decorating contractors improve their business. He has lots of experience in the field and clearly enjoys his work — that shows up in the attention to detail.